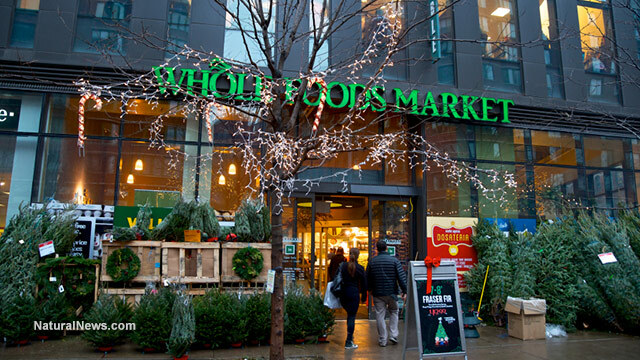 The financial outlook for Whole Foods Market continues to look grim, as consumers seeking natural and organic products continue to take their business elsewhere. “The growing demand for fresh, healthy foods, the offering of natural and organic products is expanding everywhere [in] new stores, existing stores and online,” Mackey said. Organic food sales were $11 billion in 2004. By 2014, they had more than tripled. The combined organic and “natural” foods market had grown to $48 billion by 2012 – from just $6 billion in 1998. The company’s same-store sales have fallen every quarter for the past year, with another 2.1 percent drop expected for this quarter. Overall company earnings are predicted to fall both this year and next year. And the company’s stock has tanked, falling in 2014 and 2015 to a current level of 50 percent below the 2013 high. This year, the stock has fallen more than 10 percent more. A factor overlooked by many financial analysts, but potentially significant for the Whole Foods customer base, is the company’s collusion in the recent passage of the Denying Americans the Right to Know (DARK) Act 2.0. Posing as a GMO labeling bill, the DARK Act 2.0 actually banned all GMO labeling initiatives passed by state or local governments. Within two years, the government is now supposed to roll out a completely voluntary labeling initiative that requires consumers to call a 1-800 number or use a smartphone to scan a QR code for GMO ingredient information. To top it off, the bill defines “GMO” so narrowly, that 95 percent of GMO products currently on the market are allowed to be labeled as non-GMO – including products made with corn or soy with the Bt or Roundup Ready traits. Other major “organic traitors” include UNFI (the country’s largest organic and natural foods wholesaler) and the Organic Trade Association, which represents companies such as Organic Valley, White Wave and Smuckers. 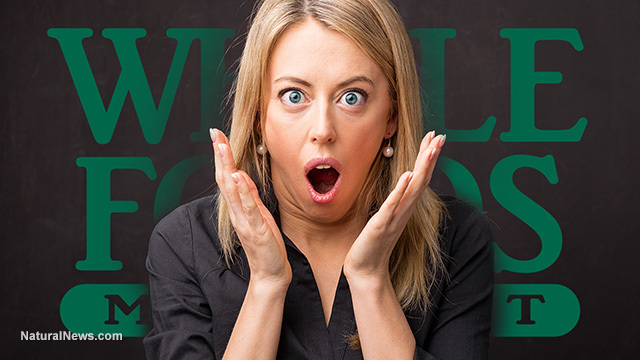 I’ve just released a damning new mini-documentary called The WHOLE TRUTH about Whole Foods. Click here to watch it now. “It’s important for the world to understand that it was the Organic Trade Association that killed our state GMO labeling laws by backing Monsanto’s Stabenow-Roberts bill,” Maine organic seed farmer and longtime OSGATA president, Jim Gerritsen, said in a statement. Now passed by both the U.S. Senate and House, this bill outlaws all GMO labeling laws nationwide. It will cause millions of people to unknowingly eat foods containing genetically engineered ingredients linked to cancer tumors, digestive disorders, infertility and death. 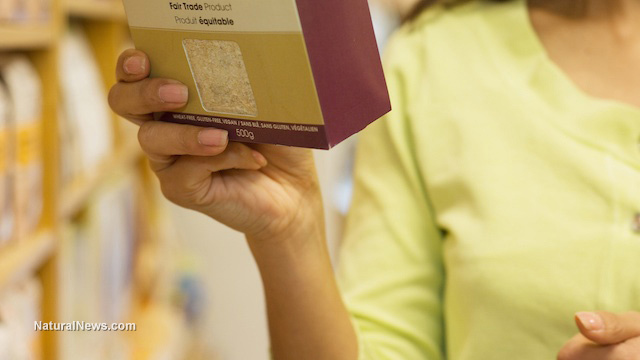 The bill makes GMO labeling entirely “voluntary” and has zero penalties for non-compliance. Even the FDA has said it would exempt as much as 99% of all foods from being labeled. There are many types of violence that can destroy lives. Kinetic violence is what we just witnessed in France with the mowing down of innocent bystanders by a 10-ton truck. Kinetic violence is what most people imagine when they hear the word “violence” but there’s another type of violence that’s causing widespread harm, suffering and death in our world: CHEMICAL VIOLENCE. When chemicals damage our cells, our organs, our bodies and minds, that is a type of violence committed against our person, especially when we are denied the right to avoid them by knowing what we’re buying and eating. Chemical violence is a violation of every woman’s body, and I mention women in particular because they are the nurturers of the unborn (and the recently born who are still nursing). Yet “chemical violence” is precisely the kind of violence Whole Foods has tolerated for the last two decades while it continued to sell unlabeled GMOs to unsuspecting consumers, many of whom falsely believed Whole Foods sold no GMOs at all. Why did so many health-conscious consumers believe Whole Foods’ lies? Because some Whole Foods stores trained their managers to lie to consumers and claim the stores sold no GMOs, even when the store shelves were filled with unlabeled GMOs. This all came out in 2013 with the Organic Spies undercover video fiasco. To this day, Whole Foods continues to sell a multitude of foods that contain glyphosate, the toxic herbicide chemical sold by Monsanto as “Roundup.” I know this because I have already tested products purchased at Whole Foods in my ISO accredited laboratory known as CWClabs.com, which is internationally recognized and accredited for conducting “analytical excellence” in food contamination analysis. Using a combination of liquid chromatography, mass spectrometry and a sample prep technique involving solid phase extraction, I’ve already seen alarming concentrations of glyphosate in products I purchased at Whole Foods. Later this year, I’m going to publicly publish a list of glyphosate-laced products being sold by Whole Foods for the sake of science conducted in the public interest. No doubt Whole Foods’ lawyers will attempt to stop me from publishing this information, but they will fail. With your support and my laboratory, science will prevail against Whole Foods’ attempts to hide what they are selling and deceive their own oblivious customers. So just how “violent” is the chemical violence related to glyphosate and GMOs that Whole Foods continues to sell? 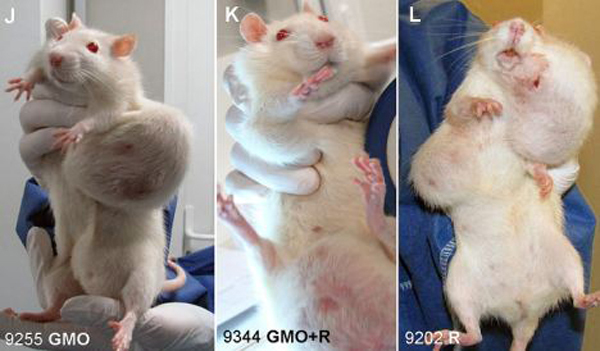 As these lab rat photos show from the Seralini Study, GMOs and glyphosate — the cancer-causing herbicide used on GMO crops — results in horrific tumors, intense human suffering and early death. The animals on the GM diet suffered mammary tumors, as well as severe liver and kidney damage. The researchers said 50 percent of males and 70 percent of females died prematurely, compared with only 30 percent and 20 percent in the control group. The federal law that now pretends to enact “GMO labeling” but actually outlaws GMO labeling was heavily promoted by Whole Foods’ CEO Walter Robb who was caught on video openly supporting the Monsanto-engineered law. 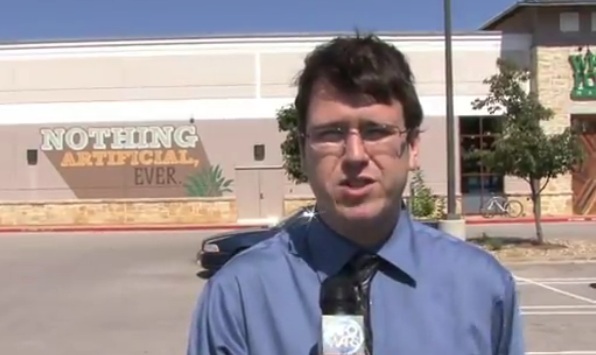 To the public, of course, Whole Foods deceptively presented a false narrative that insisted “there is no truth to these claims.” Less than 24 hours later, Whole Foods was caught red-handed in this Natural News investigation. 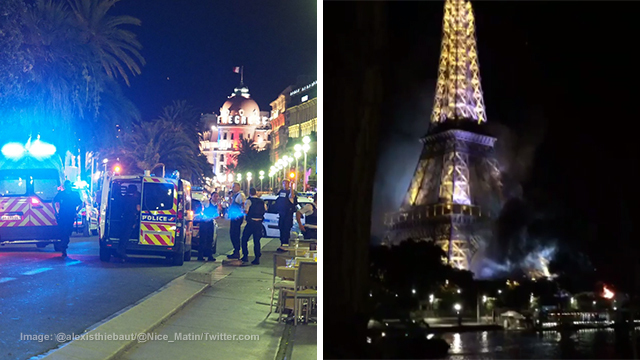 The streets of Nice, France are littered with the bodies of the dead and dying tonight, yet the cancer clinics of America will soon be littered with far more expansive suffering from the chemical violence victims of Monsanto, Whole Foods and the Organic Trade Association. To the dismay of nearly the entire organic industry, the Organic Trade Association has now been entirely infiltrated by Monsanto’s minions — the disgusting factory food giants of the organic industry. At this point, the OTA is now wholly beholden to Monsanto and the interests of chemical agriculture. Essentially, biotech operatives strapped suicide vests to themselves, waltzed into the organic industry and detonated every last echo of credibility or honesty. They are no doubt celebrating the legislative bloodshed just like ISIS Jihadis in France. Lest anyone question the comparison of biotech operatives to ISIS terrorist, allow me to assure you they both operate with the same disregard for ethics, morals, human life and the environment. I have personally been death-threated, stalked and systematically defamed by biotech industry operatives and their Monsanto mafia lackeys in the media, some of whom are named on this website MonsantoMafia.com. These people are the most vile, lawless, despicable destroyers of life ever to walk this world… and Whole Foods just combined forces with them to pass this shameful law that will deny all of us the right to know what we’re buying and eating. 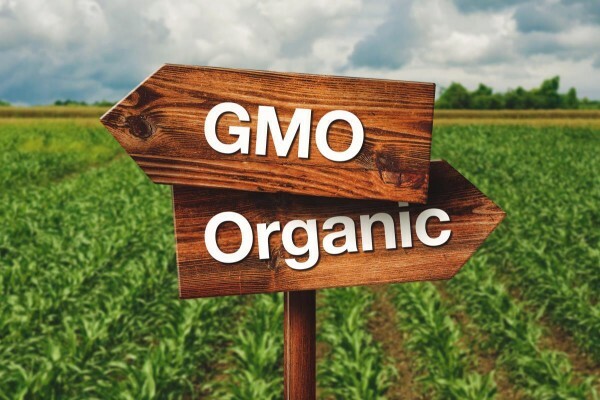 With the biotech infiltration of the Organic Trade Association, it’s now probably only a matter of time before GMOs will be redefined as “organic” and allowed into organic foods. That’s their goal: To destroy the very definition of “organic” by overrunning it. The term “organic” is now very close to being meaningless, and that’s a huge loss for all people who are desperately attempting to protect life, health and the environment. To put in all in perspective, the number of people who are going to be killed by cancer caused by GMO-related herbicide chemicals over the next 10 years dwarfs the number of innocent victims just crushed to death in France. For every one victim of ISIS terrorism in our world, there are no doubt thousands of victims of the chemical agriculture industry that maliciously pushes deadly chemicals by threatening scientists, bribing government officials and fabricating bad science just like Big Tobacco once did to sell its own cancer-causing poisons to the world. There are many ways that people needlessly die in our world. Whole Foods just contributed to a huge one that will now negatively impact all of us for decades to come. What I now know with certainty is that Whole Foods Market knows no shame and will stop at nothing to plow through the people on its way to corporate profits at any cost. When I see the streets littered with bodies laying in pools of blood and loved ones crying over their lifeless limbs, I can only think of Whole Foods and its malicious, utter betrayal of the very concept of what makes a food WHOLE to begin with. The corporation mocks us all — and mocks itself — by selling out to the interests of Monsanto and the chemical poisoners of our world. One of the best ways you can help stop chemical violence against women and children is to stop shopping at Whole Foods. Under the cover of darkness, just hours after Hillary Clinton was handed a get-out-of-jail-free card by the FBI for committing felony crimes, the Senate quietly voted 63–30 to preempt state law in direct violation of the Tenth Amendment, prohibiting individual states like Vermont from enacting mandatory GMO labeling laws passed by voters. And at least one senator (from Oregon) is absolutely outraged. Senator Jeff Merkley wasn’t afraid to call a spade a spade in the aftermath of the treasonous vote, which was further buried in the news cycle by Obama’s latest attempt at race-baiting in order to abolish the Second Amendment. Merkley told the media that the so-called Roberts-Stabenow Bill, also known as the Monsanto DARK Act 2.0, is a farce, and will do nothing to protect consumers who want to know what they’re eating. As we’ve been reporting, S.764 would exempt most GMOs currently in use from having to be indicated on product packaging, which is the whole point of GMO labeling in the first place. The only way consumers would gain access to truth in labeling for those GMOs that aren’t exempted is to scan the “smart” codes on certain products with their smartphones, but not everyone has a smartphone or even data coverage, especially in poorer and rural areas. All the way round, the DARK Act 2.0 is a disaster for truth in labeling, though it’s being touted by industry supporters as the labeling bill “we need” – of course, because it isn’t actually a labeling bill at all, but rather an un-labeling bill that protects chemical and agriculture corporations from having to properly disclose their hidden additives to consumers. An example of this is oil made from genetically-modified soybeans, which would not have to be labeled because it supposedly contains no genetic materials. Similarly, starches, purified proteins and other common ingredients derived from GM sources would be exempt from labeling. According to the FDA, it “may be difficult” for any GMO food to qualify for labeling under this appalling bill. To learn how you can grow your own food at home and avoid GMOs completely, check out the latest in urban gardening technology with the vertical Garden Tower.